How does the Bolivia Mountain School compare to the Canadian Mountain School? What is the food like in the trip? What's the usual number of people per tent? Is there a community tent for eating/gathering? Approximately how much weight will climbers carry? Do you have access to radio communications for any emergency needs if one were to arise? What is La Paz’s elevation? What are the main cultures of Bolivia? What are good souvenirs from Bolivia? You don’t need any mountaineering experience to join us for the Mountain School Program. 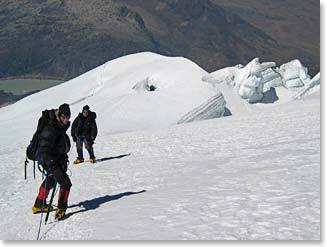 Before attempting the summit of Huayana Potosi, you will receive four full days of mountaineering instruction. If you have not been at altitude before, it is important to understand that 19,974ft/6,088m is high enough that you will need to pay close attention to your body’s ability to acclimatize. Your guides will help you make good decisions. You will gain valuable experience with a range of skills from using proper climbing technique and performing crevasse rescue to dressing properly and route-finding. 2. How does the Bolivia Mountain School compare to the Canadian Mountain School? While you will learn the same skills in the Bolivia Mountain School program as you would in the Canadian Mountain School program, there are many reasons why you may choose one over the other. The Canadian Mountain School program only operates by request and the cost will vary depending upon guide availability, number of climbers and Bolivia Mountain School operates on a fixed cost and at a set time each year. Also, you will gain valuable acclimatization experience that you would not otherwise gain in Canada where peaks are rarely over 11,000ft/3,350m. And an added bonus, you get to visit the incredibly vibrant country of Bolivia. 3. What is the food like in the trip? We will enjoy first-rate meals in fine restaurants and hotels in La Paz. We will eat simple but nutritious food (lots of potatoes, bread, soups, and small portions of meat) while camping during our climbs and treks. We will have a cook who will take care of our food on the mountain. 4. What kind of weather should I be expecting? La Paz can be hot at midday when the sun shines strong at this altitude, but evening temperatures are often cooler than most places in the U.S. In the Cordillera Real Mountains we’ll experience classic variable mountain weather—warm in direct sunlight, cool on cloudy days and at night. You will be adjusting your layers all day as you climb and hike in Bolivia. 5. How much money do we need to bring? Bolivia in general is quite inexpensive. You will not need to have much money on hand, but if you are in the habit of having drinks and buying souvenirs, for example, you will want to budget accordingly. We have traveled with people who spent as little as $100 US dollars on the entire trip for the occasional meal or drink and incidental expenses. The average is probably four times that. Major credit cards are accepted many places, and U.S. currency is easy to spend or convert in the cities. Normally, groups decide to tip the Bolivian guides and staff at the end of our climb in the mountains. We suggest each climber budget $150 - $250 dollars for this. Also, remember that airport taxes are not included. Bolivia is a place where some small amounts of currency, US $20 bills, are occasionally needed for fees. 6. What's the usual number of people per tent? 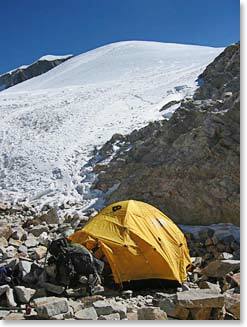 We will be using North Face V-25 tents, two people per tent. 7. Is there a community tent for eating/gathering? Yes, we have a large dining tent, tables, and chairs that are used at our base camp. 8. Approximately how much weight will climbers carry? You will need a medium sized rucksack (2,500 to 3,500 cubic inches / 40 to 60 liters) that can hold your layers of clothing for changing temperatures and activity levels through the day. Most people carry packs that weigh about 25-30 pounds. You could pare this down to perhaps 15 pounds, but with a lot of camera equipment or other personal preference type items, it might be more. A larger open mountaineer’s rucksack with side compression straps is preferable to small packs with outside pockets. 9. Does the price of the trip cover meals, land transfers, and accommodations? Yes, included; all hotels for the scheduled trip, meals on the climb and trek, airport transfers and shuttles within Bolivia. Not included, either in towns or on the climbs/treks; bottled drinks (soft drinks, bottled water, and alcohol), tips at the hotels, tips for guides, instructors and porters at the end of the trip. 10. Do you have access to radio communications for any emergency needs if one were to arise? Berg Adventures expeditions rely on a satellite telephone for possible emergency communication while we are on the mountain and throughout every portion of your trip. Our climbs are run self-contained expedition style. That is to say, complete medical kits and equipment to deal with emergencies travel with us. Bolivia has been and is still one of the most peaceful, safe, and hospitable countries in South America. Civil unrest remains, but demonstrations are not a serious threat to travelers. Bolivians are widely known as courteous, shy, and respectful people. Thousands of tourists each year travel to this little-known destination and experience warm hospitality, charming people, and a welcoming land. Like any other place, thefts do occur. It’s a wise idea to always keep a close eye on your gear and to stay with the group at all times. 12. What is La Paz’s elevation? La Paz, a bustling modern city, averages an elevation of 11,500ft/3,400m, making it the highest capital city in the world. The currency of Bolivia is called the boliviano. It is practically worthless outside Bolivia so don’t change more than you’ll need. One US dollar is worth roughly 7.5 bolivianos. 14. 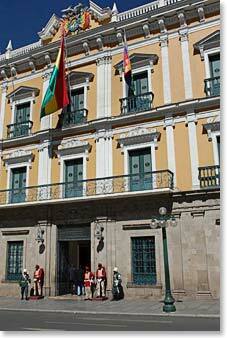 What are the main cultures of Bolivia? With a population of just over 8 million, Bolivia has one of the highest percentages of indigenous populations in the Americas – over 50 per cent of the people are of pure Native blood. They speak either Quechua or Aymara as a first language and have strongly resisted cultural change. The rest of the population is mainly mixed Andean and Spanish or “Mestizo”. Much of Bolivia’s ancient Andean culture remains alive and traditions are still firmly intact. Modern Bolivians are known to be rugged, strong-spirited, and shy. Bolivian music, with ukuleles and pan flutes, is well-known throughout the world. 15. How can I improve my chances of acclimatizing once I arrive? Once you arrive in Bolivia and have been transferred to your hotel, take a nap or rest for a few hours and avoid alcohol. Drinking plenty of bottled water will also help. We encourage the use of Diamox as a preventative aid for symptoms of AMS (altitude sickness). Talk with your physician to determine if it is appropriate for you. La Paz has a number of wonderful markets where travelers can purchase unique handicrafts and woven fabrics in llama or alpaca wool. 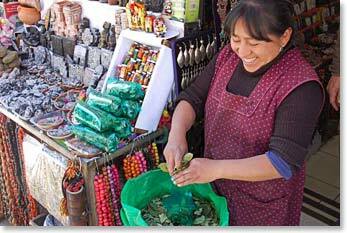 We’ll explore these markets while in La Paz.